Here is the Good news for Samsung Galaxy S6, S6 Edge users, now they can easily get the root access on their phone with Chainfire CF Auto-Root Method. If you are planning to buy T-mobile Samsung Galaxy S6, S6 Edge and want to root your phone. Now you can do this easily and root Android device. All credit goes to the Chainfire, who recently released the rooting tool for both the Android Devices. This method applies to Galaxy S6 and Galaxy S6 Edge devices that ship with unlockable bootloaders, that means SM-G920T and SM-G925T, both for T-Mobile. 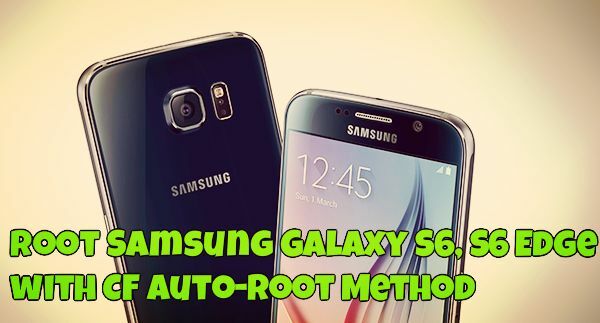 Today in this guide we’ll show you how to use the CF Auto-Root to root Galaxy S6. This guide is only for the SM-G920T and SM-G925T model numbers, don’t try this guide on any of other Samsung devices. Before following this guide do take the full backup of your phone and save it in some safe place. Yes you will lose the warranty of your device once it is rooted. But after rooting your phone you can install lots of custom ROM, Mod, and other tweaks on your phone. Check out some of the rooting benefits here. To get started all you have to download the CF Root package for your SM-G920T and SM-G925T device. Download the zip file from the below mention link and extract the folder on your windows PC desktop. In the extracted folder you will some files like CF-Auto-Root-zerofltetmo-zerofltetmo-smg920t.tar.md5, Odin3-v3.07.exe, Odin3.ini, tmax.dll, zlib.dll. To root the phone you have ti RUN the ODIN application on your desktop and flash the CF-Auto-Root*******.tar.mdf file. The process is very simple and takes a few minutes to get the root access. For Steps by steps guide to Root Samsung Galaxy S6, S6 Edge click here.